The M103 is an American tier 9 heavy tank. 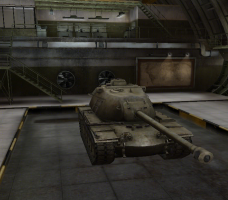 M103 replaced the T34 as the tier 9 heavy in patch 0.7.2. The fully upgraded 120mm cannon is a fantastic gun, with great accuracy, and very high penetration. 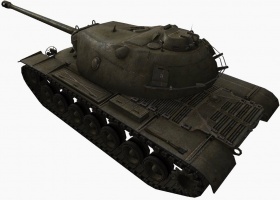 While it lacks alpha damage compared to the T-10 or E-75, the gun's reload speed makes up for its lack of damage. The M103's oddly shaped hull and well-sloped turret can make this tank a bit tricky to fight, especially at long ranges; however, this tank suffers from having very weak sides and rear armor. When fighting this tank from the front, make sure you try and hit the lower glacis as hitting the upper hull will most likely bounce. 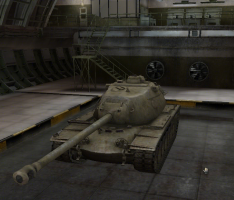 If you can only see the turret aim for the large cupola atop the tank for easy penetrations. The speed and maneuverability of this tank are quite good, so it's able to keep up with the rest of the team and provide excellent fire support when needed, and is able to turn its frontal hull towards the enemy quickly to reduce damage taken from incoming fire. 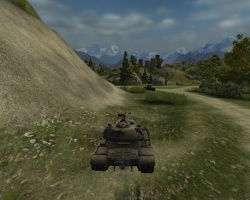 The M103 leads to the T110E5. 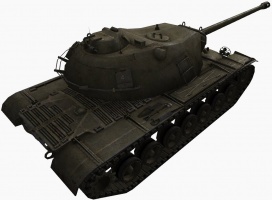 Mobility, penetration, and rate of fire are this tank's strongest attributes, it is recommended to stay with other tanks when advancing, as its lack of overall armor makes it easy to damage. Stay artillery safe whenever you are not in motion, as artillery often will target hulldown tanks which otherwise would be hard to kill. Also avoid exposing your hull uncovered as the lower glacis plate is extremely easy to hit and penetrate. You are ill-designed to play hulldown due to weak top of the turret which is easy to hit. If you really must play like this, keep moving, hiding, and try not to allow the enemy to zero in. The turret ring, while hard to hit, is also easy to damage. Do note that the turret armor, while less than excellent, can and will protect you, but only from poorly-aimed shots. Keep it pointed towards your target and avoid fighting multiple tanks at once. In close encounters, deny enemies the chance to fully-aim at the turret's weak spots. The less you rely on and expose the turret, the better the turret armor works. The M103 plays more like a very heavy medium than as a heavy tank. 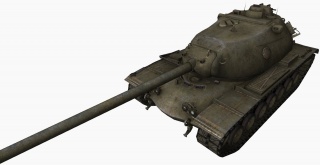 Players should try to flank heavier targets and support more durable heavies such as the E-75, the VK 45.02 (P) Ausf. B, and/or the Type 4 Heavy whenever possible. When paired with such tanks, the M103 becomes a force-multiplier. It can cover for the vulnerabilities of those tanks, such as their exposed flanks or their lengthy reload-times. With Patch 9.20.1, the M103 is officially the fastest firing (non-autoloader) heavy tank at Tier IX. Often compared to its British counterpart, the M103 now has significant distinctions that make it a tank of its own class. Before 9.20.1 the M103 used to have a slight survivability advantage over the Conqueror in exchange for less mobility. However as of the present changes in the British Heavy Tank line, the Conqueror has officially surpassed the M103 in terms of armor in exchange for reload-time and overall mobility. 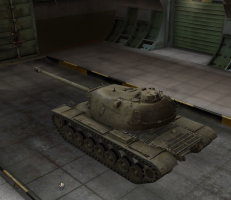 The M103 is now a true "Heavy-Medium". Players should first seek to upgrade to the 120mm, as the stock 105mm's low pen and accuracy is vastly inadequate when fighting other tier 9s and 10s. The next upgrade should be the turret, which will give the M103 a badly needed increase in durability and boost the rate of fire as well. The stock tracks allow mounting all upgraded modules, so you can wait to upgrade these if you prefer. The ground resistance is improved though and gives a higher advantage than the top engine on normal ground. 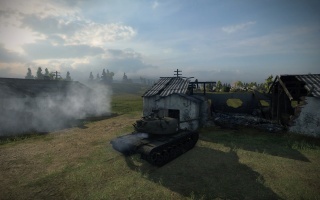 Next you should get the engine, as it gives the tank even better mobility. The M103 heavy tank served the United States Army and the US Marines during the Cold War. Until the development of the M1 Abrams in the mid-1970s, it was the heaviest and most heavily armed tank in US service. 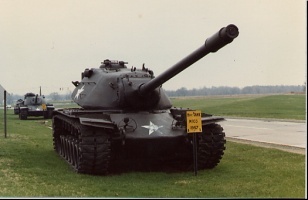 The M103 was manufactured at the Detroit Arsenal Tank Plant and the first units were accepted in 1957. The last M103s were withdrawn from service in 1974. Like the contemporary British Conqueror tank, the M103 was designed to counter Soviet heavies such as the Josef Stalin tank or the T-10 if a conventional World War III broke out. Its long-ranged 120 mm cannon was designed to hit enemy tanks at extreme distances, but it was never used in combat. In 1953-1954 a series of 300 tanks, initially designated T43E1, were built by Chrysler at the Newark plant. Testing was unsatisfactory, and the tanks were all stored in August 1955. Only after recommending improvements, on 26 April 1956 the tank was standardized as the M103 Heavy Tank. Of the 300 T43E1s built, 80 went to the US Army (74 of which were rebuilt to M103 standard), and 220 were accepted by the US Marine Corps, to be used as infantry support, rebuilt to improved M103A1, then M103A2 standards. The successive versions of the M103 shared many components with the M47 and M48 Patton tanks and the M60, which, with the exception of the M60 (a main battle tank) were all considered 90 mm gun (medium) tanks. Tracks, rollers and suspension elements were the same, with some modification to take into account the greater weight. The engine and transmission were never modified enough to give the extra power needed for the greater weight of the M103, and as a result, the tank was relatively underpowered and the drive systems were fragile. The turret of the M103 was larger than that of the M48 or the M60 to make room for the huge 120 mm gun and the two loaders assigned to it, in addition to the gunner and the commander. The driver sat in the hull. The gun was capable of elevation from +15 to -8 degrees. The armor is made from welded rolled and cast homogeneous steel of varying thickness. M103A1 1959. 219 converted or rebuilt. New sight (Stereoscopic T52) and T33 ballistic computer. Removed one coaxial machine gun. New turret electric amplidyne system traverse. Turret basket. M103A2 1964. 153 converted or rebuilt. New 750 hp (559 kW) diesel engine from the M60 tank, increasing the road range to 480 km and maximum speed to 37 km/h. New sight coincidence XM2A. Estes, K.W., 2013, M103 Heavy Tank 1950–74, New Vanguard Series 197, Osprey Publishing, Oxford, 48p, ISBN:9781849089814. This page was last modified on 23 December 2018, at 15:24.